Find hotel near Point Addis Marine Nation .. If you are on the south coast of the country, then you can pay a visit to this marine national park. You will be greeted here with the serene beauty of the park along with a typical combination of various marine animals. As it stretches for about 10 kilometers along the coastline, you can expect a quiet beach here. If you like surfing, then this is a pristine location for you, as there are few rock pools with some fish in it. The coastline is exposed to intensive waves in the evening. The view of the lofty mountains, sandy beaches, marine environment and cliffs will make you visit this place time and again. 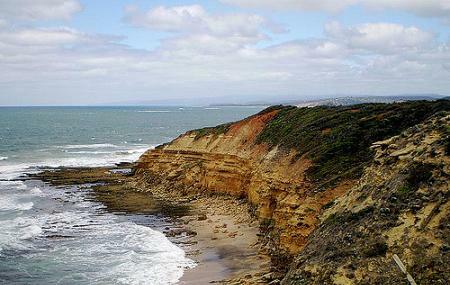 Try the best Anglesea trip planner to visit this Point Addis Marine National Park as well as many others. Hotels like Great Ocean Road Resort, Lightkeepers Inn Motel and Torquay Tropicana Motel will solve your problem of where to stay in Anglesea. Draft the best Anglesea vacation packages using ideal templates offered by TripHobo. Also explore how to reach Anglesea on the go! Love this? Explore the entire list of places to visit in Anglesea before you plan your trip. Fancy a good night's sleep after a tiring day? Check out where to stay in Anglesea and book an accommodation of your choice. One of the most spectacular spots on the Great Ocean Road. Incredible beach, and one that (other than on warm summer days) is generally pretty quiet. Nice place to spend an evening with a bottle of fine red, specially when no-one is there..
Point Addis it's is such nice beautiful place to spend some hours with family. Its a beauty beach with clear water also very safe for kids.